Prague is connected with Cesky Krumlov by direct buses which are part of public transport. This kind of transport is very popular, cheap but also a bit difficult due to language barriers. All conections can be found at online schedule - timetable information system (Czech, English, German). Cesky Krumlov bus station is very close to town center so we strongly recommend the bus (train station is far from the center and the train is slower). Need you a schedule for your trip to Cesky Krumlov? It is easy: Make at least one reservation over discoverczech.com and we will provide you requested info for free as a additional value to your reservation. Have you any questions? Email us! I would like to have a bus schedule (with fares) from Prague to Cesky Krumlov from 19 June to end June. (one way only) Thank you. Could you please send me, in English, the bus schedule, price, and departure point in Cesky Krumlov for bus to Prague at end May (one way only). Thank you. Hi, please send me the details of buses from Prague to CK, I plan to visit CK on 26/9. Thanks. Please, send me the bus fare, departure point and timetable from Prague to CK (and return) in set 2014. In English. Thank you. Hi! I´d like to go from CK to Prague. Is it easy? How can I do? Do you have private transfer? How much is it? Hi, we would like to travel by bus from prague to cesky krumlov on nov. 2014. Can you please send the schedule for the bus in English? Thank you! Hi, I am planning to go from Prague from Cesky Krumlov at the end of July. Can you please kindly send me the departure point, bus schedule and fare info in English? thanks. Could you please send me the bus fare and timetable from Prague to CK? I am wondering how to make an online reservation. Thanks. Where in Prague is your bus station from where the buses leave for Cesky Krumlov? What is the cost per Ticket? How often the bus atarts after 2PM? How do we need to book the seats & when? Hi, would you please send me the details for the bus timetable as well as the price for two adults, bus location and relative info in English from Cesky Krumlov to Prague. I am scheduling my trip in Feb 2014. Thank you so much!! 2seniors would like to travel by bus from Prague to Ceky Krumlov on 12th October 2013. Could you please send a bus timetable in English. Thnak you. I would like to know the bus schedule from Prague to Cesky Krumlov (16/6/2013); Cesky Krumlov to Prague (17/6/2013). I do not want to join the one day tour and do not want a private car. Please provide me the information. Thank you. We will travel from Vienna to CK on 15 April (Mon), do you have any transportation suggestion? If yes, please advise the details including the timetable, price, bus station etc. Then we will go from CK to Prague on 16 April (Tue), please also advise if any suggestion and the details. Thanks! I am planning a trip to Cesky. From there I will be travelling to Hallstadt. From Hallstadt, I will be travelling to Budaphest. Kindly sent a copy of the bus and train timetable in English and how and where do I purchase the bus or train ticket. Thank you. I am planning a 2-day trip to Cesky Krumlov from Prague. Would you please find send me details for the bus service in English (i.e. timetable, price, bus station location, etc.) from Prague to Cesky Krumlov and also from Cesky Krumlov back to Prague. I am scheduling my trip in April 2013. Hi, I wish to travel from Prague to Cesky Krumlov in the morning, then Cesky Krumlov to Vienna at night on the same day in mid-April. Could you please send me the bus schedule and ticket cost from Prague to Cesky Krumlov and from Cesky Krumlov to Vienna in English? Also, will I be able to purchase the ticket on-line? Thank you so much! Hi...2 of us will be in Prague 11-15 March & would like to make a day trip by bus to Cesky Krumlov on Thursday 13th. Would you kindly email me a timetable in English, with location of the bus station in each town & fares (1 full fare, 1 senior if applicable). I understand the bus is much easier than the train. Many thanks & regards. Could you pls provide me about the bus information from Prauge to Cesky Krumlov in english and ways from CK to Hallstatt. I will be there at May 2013. Would you please send me details for the bus service in English (i.e. timetable, price, bus station location, etc.) from Prague to Cesky Krumlov, Cesky Krumlov to Budapest. I am scheduling my trip in Feb 2013. Can you please send me lovation of the bus station in Prague? I am planning to leave Prague to Cesky Krumlov on 26th Dec 2012 and return to Prague on 28th Dec 2012. Could you kindly send me the bus schedule e.g. timetable, price, bus station location, in English. Appreciate it. Would you please send me details for the bus service in English (i.e. timetable, price, bus station location, etc.) from Prague to Cesky Krumlov, Cesky Krumlov to Vienna, Vienna to Salzburg, and Vienna/Salzburg to Prague. I am scheduling my trip in Oct 2012. Pls provide the time table from Prague to Cesky Krumlov. I prefer the direct, no- transfer route. Also, I would like to have the advice on getting to Linz, Austria from Cesky Krumlov. I would like to have the bus timetable and price list for Prague - Cesky Krumlov (return). I will be travelling around the first week of Oct.
Could you pls provide me about the bus information from Prauge to Cesky Krumlov in english and ways from CK to Hallstatt. I will be there at oct 2012. Can you send me the bus information in English from Prague to Cesky Krumlov and Prague to Budejovice? I will be in Prague from 19/7 - 22/7/2012. Grateful please send me the details for the bus service in English (e.g. timetable, price, bus station location, etc.) from Prague to Cesky Krumlov, Cesky Krumlov to Vienna, Vienna to Salzburg, and Vienna/Salzburg to Prague. I will arrive Prague on 19 July, 2012 and will return to Hong Kong from Prague on 26 July, 2012. Would you please send me an English bus timetable from Salzburg to Cesky Krumlov and from Cesky Krumlov to Prague? Thank you. I will be travelling through Cesky Krumlov from Prague and then on to Vienna. Can you please send me a bus and train timetable in English. Thanking You. I would like to know the bus schedule from Prague to Cesky Krumlov; Cesky Krumlov to Prague and Cesky Krumlov to Vienna. I do not want to join the one day tour and do not want a private car. Please provide me the information. Thank you. Hi, look for bus service from Vienna to Cesky Krumlov and Cesky Krumlov to Prague, would you plz send me bus time table with the price in english. As well as the booking. Could you please provide me with bus times for may 2012 & also the price of a bus tickets both single & return as we are thinking of comin for a 2 night stay in May during our visit to Prague. I would like to book the bus ticket from Prague to Cesky Krumlov on 05.04.12, do you have the bus around 11.00 am?? How much is the price/person? Where should be the pick-up point? We will stay at Julis Hotel. Hi I will be travelling through Cesky Krumlov from Vienna and then on to Prague. Can you please send me a bus schedule and price in English for Vienna -> CK and CK -> Prague. Thanks in advance! Can you please provide me with a timetable (with prices) by Prague Public Transport bus from Prague - Cesky Krumlov for May, 2012? Cesky Kumlov to Prague May 26 2010 - 4 senior pax pls advise details departure n arrival, fares thank you. Could you please send me the schedule for the bus running from Vienna to Cesky Krumlov and From Cesy Krumlov to Prague in April 2012? I wish to travel from Prague to Cesky Krumlov and come back to Prague. Please send me the schedules for buses with fares. Can you instruct me on how to reserve a bus ticket from Prague to Cesky Krumlov on the 21st of Feb 2012. I need a 2 passenger roundtrip, hopefully with departure in the morning. Id also like to know the prices of these tickes. Can you send me a timetable of buses from prague to cesky krumlov? Could you let me know how much a ticket costs please? Excuse me. How can I find the schedule for the buses from Prague to Cesky Krumlov? So confusing! Could you please send me bus schedule and ticket cost from Prague to Cesky Krumlov and from Cesky Krumlov to Vienna? Can I buy the ticket on-line? Thanks a lot. Trying to find a bus schedule in English. I need to know the bus schedule for traveling from Pregue to Cesky Krumlov in Sept 2011. I would also like any hotels that you would reccommend for Americans in a good location. Can you instruct me on how to reserve a bus ticket from Prague to Cesky Krumlov on the 18th of july 2011. I need a 2 passenger roundtrip, hopefully with departure in the morning. Id also like to know the prices of these tickes. Could you please advise on the followings? 1. If I would like to reserve the bus ticket online from Prague to Cesky Klumlov in advance, how can I do? Which website or email address? 2. How much does it cost per person for the bus from Prague to Cesky Klumlov? 3. Time that I need to reserve is on 13 July 2011 at 8.15am in Prague. Due to I travel with my mom 74 years of Aged so I need to make sure that I get the seat on that time. 4. Is there any bus from Cesky Klumlov to Salzburg, Austria operated daily? How can I find time table and fare? Thank you for your informative site I wish to visit Cesky Krumlov from Prague en route to Vienna. Can you please send me a bus and train timetable in English, along with prices? Can you please give me address of bus stop (from Prague) and names of closest hotels.We hope to travel in May 2012. Many thanks. Thank You. Could you tell me how far in advance we can book bus tickets from Prague to Cesky? How much does it cost to bus from Prague to Cesky Kromlov and how often do they depart? How long is the journey? I will travel from Prague to Cesky Krumlov on May 5 morning and leave Cesky Krumlov on May 7 morning. Do I have to book via internet? How frequent are the buses? Could you please send me bus schedule from Cesky Krumlov to Prague on 25 April 2011, as well as, price and how to book. in English? Thanks a lot! Could you please send me bus schedule from Prague to Cesky Krumlov, as well as, price and how to book. in English? Thanks a lot! Could you please send bus timetable in Eng from Cesky Klumlov to Prague and how to make the online reservation? Thank you. I wish to travel by bus from Prague to Cesky Krumlov in September. I would like to know the price. Is there a direct bus or do you have to transfer? What time will the first bus leave Prague to Krumlov? 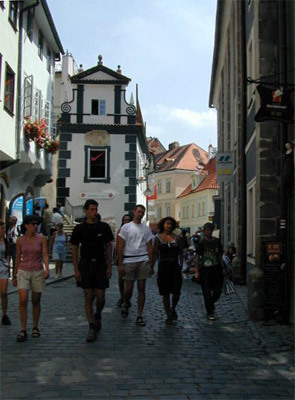 We wish to travel from Prague to Cesky Krumlov on 28 August 2011. Please advise how we go about booking the bus for this trip, what time the buse go, and the cost to do this. We would appreciate finding this information as soon as possible. I wish to travel from Prague to Cesky Krumlova on Tuesday, April 12, 2011. I plan to travel from Cesky Krumlova to Vienna on Wednesday, April 13. Could you plkease send me a timetable and price for these trips? Thank you. I wish to visit Cesky Krumlov from Prague or Munich in the summer of 2011 with my wife and baby girl, en route to Vienna. Can you please send me a bus and train timetable in English, along with prices? Can you please give me address of bus stop at Praque. I will be visiting American artist friends in Cesky Krumlov for New Years, approx. Dec 27, 2010 - Jan 7, 2011. The most direct buses to/from Prague/Cesky Krumlov schedules and tips would be appreciated. I wish to visit Cesky Krumlov from Prague on 28-11-2010, en route to Vienna. Can you please send me a bus and train timetable in English, along with prices? Can you please give me address of bus stop at Praque. Could you please send me timetable and price for bus from Cesky to Prague? Thank you. Please send me a complete bus timetable in English for buses going between Prague and Cesky Krumlov (and return), with prices. I cannot read Czech. Could you advise me if it is necessary to book the bus from Chesky Krumlov to Prague and also if one suitcase per person is allowed - we will be travelling late September. We would like to leave late afternoon, about 3pm - is that possible. Also, cost and where to find the bus. Hello can you tell us if there is a bus from Cesky Krumlov to Prague? We will be in Cesky in September 2010. Can you also give us the cost? Please send me bus time schedule in 3 July and 4 July, from both Prague to CK and CK to Prague, in English including the cost of a two way ticket and way of booking. Thanks a lot. I need the bus schedule from Prague Wednesday, June 23 to Cesky Krumlov. Then on from Cseky Krumlov to the Prague airport on the 25. In English, please. Please can you send me an french or english bus timetable (or else)traveling from Praha to Bzi (or the nearest city) on 2 juli and returning to Praha on 15 or 16 juli? What is the cost per person? Where can I buy the tickets in advance please. (we are a group about 15 people 17-18 years. Thank you very much. Please send me an English bus timetable traveling from Prague to Cesky Krumlov on June 9 and returning to Prague on June 10. What is the cost per person? Where can I buy the tickets in advance? Thank you. Pllease send me the bus schedual and fares from CESKY KRUMLOV to PRAGUE durring April 2010. Thank you. Please send me bus schedule and fares from Prague to Cesky Krumlov in English please for summer 2010. I wish to visit Cesky Krumlov from Prague en route to Vienna. Can you please send me a bus and train timetable in English, along with prices? Can you please give me address of bus stop (from Prague) and names of closest hotels. Many thanks. Thank You. Bus timetable for trip Prague to Cesky Krumlov and return to Prague airport if possible please. Please quote the price of tickets. Require reply in English please. Please send me bus time schedule in 1 Aug and 2 Aug, from both Prague to CK and CK to Prague, in English including the cost and way of booking. Thanks a lot. Hello! Please send me the bus schedule between Prague and Cesky Krumlov in English. Two people will go from Prague to Cesky Krumlov and return back to Prague. Please also include the ticket cost for return journeys. Also, where is the bus station in Prague? Thank you! I need to know the time table of the buses from Cesky Krumlov to Prague on The 1st of januray 2010. The Student agency doesnt have buses for early moening. I need a bus that will reach Prague at about 9.30 -10.0 in the morning. How do I go about this??? Please send me bus time schedule in December 26, from Prague to CK, in English including the cost and way of booking. Many thanks. Please send me the bus schedule between Prague and Cesky Krumlov in English. And is it necessary to order tickets some days before or it is possible to by it in the bus station ? My husband and I want to go from Pgrague to ?eské Bud?jovice. Can you please send me the timetable of the buses and the train services and cost of these services for senior citizens. Please send me the bus schedule between Prague and Cesky Krumlov in English. Two people will go from Prague to Cesky Krumlov and return back to Prague. Please also include the ticket cost for return journeys. Also, where is the bus station in Prague? Thank you! Please send me the bus schedule between Prague and Cesky Krumlov in English. Four people will go from Prague to Cesky Krumlov during November. Please also include the ticket cost for each way. Please tell me the schedule for bus travel from Prague to Cesky Krumlov as well as the cost one way per person. Also, where is the bus station in Prague? Thank you! We are staying in Cesky Krumlov and would like the times of buses from Cesky to Prague for a Wednesday and Thursday and from which bus station and return journey. Thank you! Please send me a complete bus timetable in English for buses going between Prague and Cesky Krumlov (and return), with prices, in English. Where are the answers to the questions posed on this site? I, too, want to stay overnight in Cesky, like the question from Edmund, 8/2009, but I do not see the responses. Help! Thank you. Could you please send me the bus fare from Prague to CK? I am wondering how to make an online reservation. Thanks. Can you please send me the schedule for the buses from Krumlov to Praque on and from Praque to Krumlov in English please. Thanks so much. I will be staying overnight in Cesky Krumlov, so the one-day tour probably won't work for me, will it? However, the bus schedule has no English translation. Would you please send the timetable... or else tell me that I can take the guided tour and return the following day. Can you please send me the price of the bus from Prague to Cesky and also whether or not we will have to book online first? Would you please send me a bus/coach schedule from Prague to Cesky Krumlov with prices? Thank you kindly. Hi. I need the bus schedule and fares from Cesky Krumlov to Prague in English please. Thank you. Can you please forward the bus schedule to go from Prague to Cesky Krumlov? Thanks, we are planning to be there in September. How about price for the bus fair? Hi I will be travelling through Cesky Krumlov from Prague and then on to Vienna. Can you please send me a bus and train timetable in English. Thanking You. I don't read Czech. Please send me a bus timetable in English. Thank you. I am wondering how to find out the schedule for the buses running from Prague to Cesky Krumlov. I am finding it very confusing and I don't speak Czech. Thank you! Unfortunately the national bus timetable is not very helpful unless you read the Czech language. Can you please provide the times of buses from Prage to Cesky Krumlov on a Friday and from which bus station. Thank you very much.